Fakes, Forgeries, and Reproductions: How do they affect Marklin? A fake shall be described as any item that has been altered in order to enhance its value. The fake shall have at least one part that is original. The fake is sold as 100% original and any modifications are not described in the terms of sale (i.e. A German outline train repainted in British livery and sold as a completely original British version train). A forgery shall be any item that is a 100% exact copy of an original item and is sold as an original (i.e. A complete replica of the CCS 66 12920 crocodile sold as a completely original train). A reproduction, whether a single part or an entire train, is an exact copy of an original item and is sold as such (i.e. A reproduction part for a SK 800 locomotive sold as a reproduction or a reproduction of the E 800 LMS train sold as a reproduction). As can be seen from the above definitions, it is extremely important to look at how the item is described when it is sold. Selling an E 800 LMS locomotive as an original and selling one as a reproduction are two entirely different circumstances and have equally different effects on the market. In order to attempt to get a better understanding of such market effects, we will take the E 800 LMS locomotive as our example; it is a suitable example because it was originally produced in 1938 in relatively small quantities and is extremely sought after in the collector market. It’s relatively low supply and high collector demand has created the need for quality reproductions. Ritter restorations filled this need by producing a reproduction of the E 800 LMS as well as some British version passenger cars. Now we devise a hypothetical time frame of 5 years in which all of our E 800 LMS locomotives (fakes, forgeries, and reproductions) are sold in the market. Each of our collectors will be participating and has a general “interest” in the E 800 LMS. From this scenario, we will be able to see the effect of fakes, forgeries, and reproductions on a clearly defined market. In the first year an original E 800 LMS locomotive comes up for auction in Germany. It is described as 100% original and in fact, it is. The estimate for the locomotive is $500-$1,000. Collector A is not very interested in the locomotive; he doesn’t quite have the money for it and he would prefer to buy several average Marklin locomotives to run on his layout. Collector B is interested in the E 800 LMS and is planning to bid $800 for the locomotive because he has the budget to buy the train, but could possibly be interested in buying a reproduction instead. Collector C is very interested in the locomotive and is planning to spend his entire yearly budget of $3,000 on the locomotive; he knows it is original and values this greatly. Collector X is similar to Collector C, but has a greater budget for the locomotive and is willing to pay $4,000 for the train. Collector Y simply doesn’t have the budget for the locomotive, but realizes it’s value and puts in a bid of $600 hoping he might get a deal. Collector Z is interested in the E 800 LMS, but is too worried that the locomotive might be a reproduction (he has heard there are reproductions out there) and so he doesn’t put a bid in because he feels that he isn’t experienced enough to buy such a rare item. The auction ends and the original E 800 LMS is sold to Collector X to $3,100. All the other collectors are disappointed they did not win the original E 800 LMS, but they are hoping there might be another original E 800 LMS in the market that has yet to appear. Collector A realizes that the reproduction of the E 800 LMS is an adequate substitute for an original and decides to purchase one for $140 USD. Collector A is now out of the market for an E 800 LMS. Collector B decides to hold out for an original because he has the budget to buy one. The hype of the auction made him really excited to buy an original. Additionally, his friend Collector A has a reproduction and Collector B wants to upstage him by buying an original E 800 LMS. Collector C is mad that Collector X outbid him, but he knows that at the next auction Collector X probably won’t be there since he already has an original. He is hoping that he can buy an original E 800 LMS for around $3,000 or less. Being an expert collector, he has the confidence to know exact what he is buying and also considers himself a connoisseur, unfit for low-quality reproductions. Collector X is happy to have been able to get his hands on an original E 800 LMS; he proudly displays it in his collection for all his collector friends to see. Collector Y realizes he will never be able to afford an original E 800 LMS unless he starts making forgeries (which he can do because of his expert knowledge). He creates a forgery and offers it to Collector Z. Collector Z, convinced by Collector Y that the E 800 LMS is original, buys it for $2,500 thinking he has just scored a great deal. He doesn’t realize it is a forgery because of his below average knowledge. Collector Y is very proud of himself that he was able to imitate the impeccable quality of Marklin trains and was able to pass off his creation as original E 800 LMS. Collector Z, now with an E 800 LMS forgery, is out from the market for an E 800 LMS. Collector Y – possibly in the market now that he has enough money to buy an original from the sale of his forgery. It is possible that he will make a forgery for himself, but seeing that he is an “expert,” he will probably only accept an original for himself. As can be seen from the above analysis, the effect of each event depends upon a number of factors and cannot be exactly correlated with a quantifiable effect of, say, the sale of a single forgery. The most important factor in each scenario is not the budget of each collector, but rather his or her knowledge, which in some ways limits the budget. An expert collector would not be as willing to spend $2,500 on a forged E 800 LMS than a below average collector who cannot tell the difference. In many markets, forgeries can cripple the market because collectors (even experienced ones) cannot tell the difference between an original and a forgery. However, such tendencies cannot be applied to all markets – what if the collector does not care if he has purchased a forgery because he cannot even tell the difference. As such, the introduction of forgeries is different for each and every market. Reproductions are assumed to not have this same effect because by our definition, they are always sold as reproductions and not originals. The idea of a fake, which has been previously left out of our hypothetical world, is thought to have a similar effect as a forgery but to a lesser extent. The problem with fakes, however, is that they literally blur the line between a forgery and an original since, by definition, they have parts from both. Like a forgery, they create value in a market (original Marklin trains) out of materials that come from outside the market (Zinc metal, machining labor, etc.). However, since some parts of the fake are original, they create less additional value than a complete forgery and are therefore less “harmful” to a market. Luckily, at this point in time for the market for Marklin trains, there is less of a demand for fakes, forgeries, and reproductions because Marklin collectors place an extreme value on original trains that have substantial provenance. Any faked or forged trains that come up for sale are usually of very poor quality and can be identified by the average collector. Reproduction trains are generally well regulated and modified so that they can easily be identified by any Marklin collector with a general experience in collecting vintage Marklin. 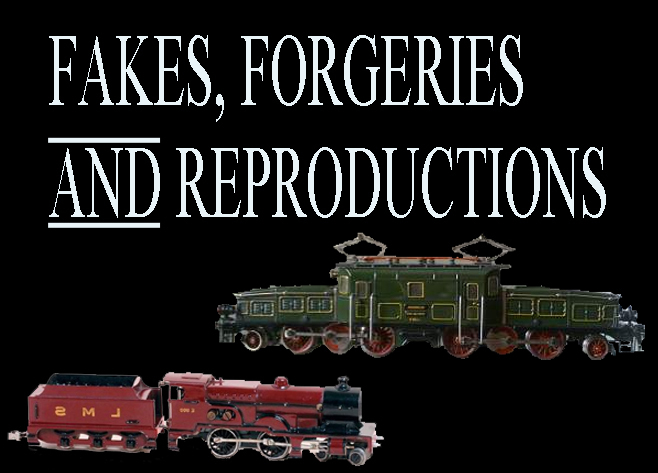 In future years, however, a high demand for fakes and forgeries might be created by ever-increasing prices for original Marklin trains. With this increase in demand, however, there is also an increase in an equal, but opposite demand for highly reputable dealers who are known for selling 100% originals who Marklin collectors come to trust. In the end, it is a constant battle between the forgers and the advanced Marklin collectors who are capable of identifying these forgeries. Very interesting analysis. This definitely will keep me on my toes for identifying fakes and forgeries in my future purchases. Very smart analysis : a proof that a Marklin collector can also be a wise economist. Thank you very much for this interessting analysis! The above “analysis” does not differentiate between so called “fakes” and an original Marklin piece that has had some needed paint restoration so that it can be displayed and look attractive within the collection. Clearly, such paint restoration, if done expertly should not devalue a piece. In fact, I believe it should enhance the value of a piece if it is done professionally and is disclosed to the buyer. Many thanks for your comment. As always, it is hard to cover all the possible combinations of fake, replica, restoration, “needed restoration,” etc. and so I limited the scenarios to a few manageable ones and thought about how this would affect the market. In my opinion, the value of a restored item depends most on the buyer’s acceptance of any alterations from the original state of the item. Removing rust and professional cleaning to reveal original paintwork, for instance, almost always increases the value. Removing old chipped paint to repaint an item again in perfect condition, however, usually lowers the value for very old, rare items because the “original qualities” and signs of age and use have been removed and many collectors find this factor very important. 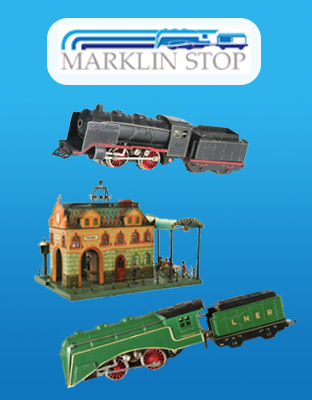 We are always looking to buy Marklin toys and trains! Click here to get a free evaluation. © Marklin Stop. This website is in no way affiliated with Gebr. Marklin & Cie. Its logos and trademarks are protected. 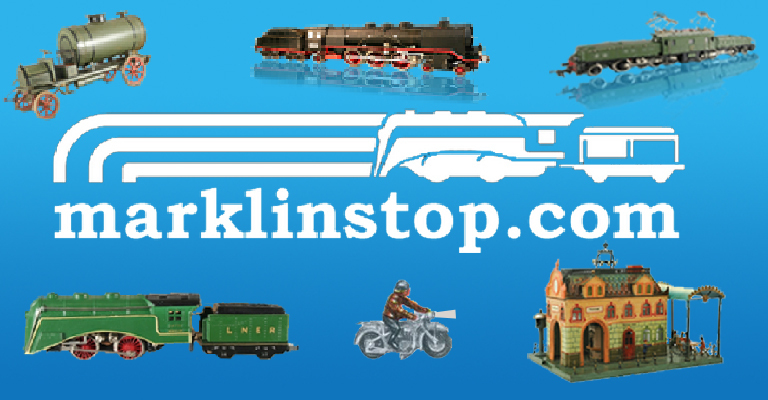 Receive our low-volume newsletter with articles on Marklin history, rarities, interesting lots, upcoming auctions, and more delivered about once a month. Free Marklin Updates to Your Inbox! Join 3,000+ subscribers and receive a low-volume newsletter with articles on Marklin history, rarities, interesting lots, upcoming auctions, and more.